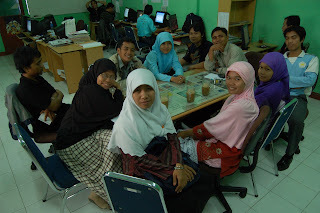 Amanah saya di ESA (English Student Association) periode 2008/2009 mengantarkan saya pada beragam pengalaman. Tak hanya 'mencicip' bangku Project Manager English Pintar 2008, saya juga berkesempatan untuk menjadi bagian dari teman-teman ESA yang mewujudkan program English Day on Tribune. Apa sih English Day on Tribune itu? As I said in the earlier, English Day on Tribune ini adalah salah satu program ESA di periode kepengurusan 2008/2009. Sesuai judul, program ini hadir per pekan, muncul setiap hari Sabtu di harian Borneo Tribune. Kenapa ESA memilih Borneo Tribune? Baiklah, mari bernostalgia mengenangnya sejenak, tentang cerita dibalik program English Day On Tribune. June 13th 2008, a bunch of happiness came to ESA Executive Board that day. The offering from ESA to have English Pages on Newspaper was granted by the Editorial Chief of Borneo Tribune, Nur Iskandar. Now, we can enjoy English on Tribune! A good thing if you still remember about one of ESA Event which also cooperated with Borneo Tribune. It was English Pintar (EP) 2008 which brought theme: Do March for Better Tomorrow! The idea for conducting this cooperation actually has been delivered on January 2008, the day when EP committee came to Borneo Tribune. The Chief of Borneo Tribune Editorial inspired the committee to have a page which will be written in English for the newspaper. Unfortunately, the brilliant idea couldn’t be made up soon after EP finished. However, the idea for having cooperation is never omitted from mind, both of Mas Nur Iskandar’s and the committee’s. A dream to realize this program kept running on. Till finally, ESA executive board found a very right moment to visit Borneo Tribune. 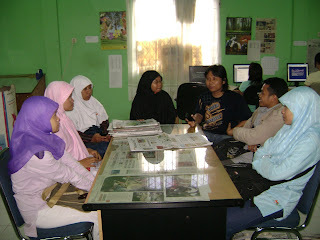 Dedi Irwan, the ESA Director for 2008/2009 led the team which were Dini HZ, Ummi Salamah, Siti Hajaroh, Dewi Ismu, Riyanto, and Novi Rianti to have discussion with Borneo Tribune Editorial, Mas Nur Iskandar and Mas Alexander Mering. Then, the discussion went on as we have been together for such a long time. Hours felt like seconds! That’s one of the reasons of why ESA considered having cooperation with Borneo Tribune for this program. It also has been told when two of the important people for this program broadcasted in Radio Volare 103,4FM for the program “Dunia Kampus”. Dedi Irwan said that there are two considerations of why ESA chose Borneo Tribune to have cooperation with. First, it is because of the fellows of Borneo Tribune are so friendly to ESA members and other students who want to cooperate with. Even, ESA has been in cooperation with Borneo Tribune and Tribune Institute before this program held and for any kinds of event. Not only with ESA, but Borneo Tribune is also friendly and opened to other students of Universities in Pontianak. “We never say no for the proposal of those who need our help, especially for the publication. It’s very nice to help students and cooperate with you all,” Mas Nur Iskandar said. That’s why, it triggers the strong relationship between ESA and Borneo Tribune. It’s not merely about the friendly and warm welcoming from Borneo Tribune. Dedi and ESA Executive Board also see that Borneo Tribune is the only newspaper in West Kalimantan which provides special column for Education. So, seeing this, ESA believes that Borneo Tribune has the same vision in conducting this program. This program is also integrated to Tri Darma Perguruan Tinggi: Educate, Research, and Dedication to Public. Through this page, ESA and Borneo Tribune hope Pontianak citizen, especially the readers for the near future will have new motivation to learn English. We really hope English Day on Tribune will be advantageous in improving your English! Well then, itu dia sekilas tentang English Day on Tribune. For the near future, di blog ini tampaknya akan muncul beberapa artikel yang pernah saya siapkan untuk diterbitkan di halaman English Day on Tribune waktu itu. Back to the past , ESA , is one of wonderful memories I have had during at FKIP University a few years ago. Headed by Mr Abdullah Thohir , I got many talented and brilliant friends and met wonderful students as well. For me personally , I would like to meet Mr Nur Iskandar, a great man in media coordinator business all across Kalimantan. penting donk kak, jadinya org tau klo tribune pernah menerima kk hehe..